Only From Time To Time, are There Fresh Mutations in The world of Art such as Astonish our Eyes. As we view Neeraj Gupta’s Marble sculptures, we at once realize that they are not the standard “run of the mill” variety. For once, these works are entirely independent of all forms and manners of sculpture on the Indian scene, and that without being fanciful in the least. From past many centuries, humans have developed themselves as superiors in art and culture. There were times when medieval art and Egyptian works got praised all across the globe and as the world started connecting closely, the art travelled all the way to the roman’s, Greeks and conquered the whole globe. In recent times if you visit any of the great museums in the world being the Paris art galleries or The Victoria and Albert museum in London, the Marble sculptures have set up a benchmark for modern art and their carvings are world-renowned and extraordinary. Artist Neeraj Gupta specializes in such marvelous marble sculpturing art and is known round the country for his astonishing artworks. The history witnesses their transportation from many decades through sea routes as different cultures have their own ways of designing this ancient art formMarble is known as one of the oldest part of the earth’s crust, though marble is white but it also comes in different colours. Mughals got this stone in fame and today we relish it as one of the Seven Wonders of the World, it’s the iconic Taj Mahal. These marble sculpture art originated in the times of our gods and prophets and has travelled along with the human race from centuries. Their existence is mentioned in many of the ancient books and their appearance is so diverse and unique that even after many years of their existence, they still look calming and composed to the viewer. Marble Sculptures is one of the ancient art forms and exists in every culture and civilization on this globe. The durable character of marble makes it easy for chipping over and is probably the best product available for standalone statues making them look elegant and fine. Many big cities on the globe offer various options of purchasing marble statues and home sculptures ,while internet is one of the best options to deliver the masterpiece from anywhere on the globe to your doorstep . Marble sculpture is one of the most prominent and accepted form of art that is adapted by artists worldwide and appreciated by people since generations. In comparison to other materials, marble holds a better preference because of its several advantages. Because of this prime reason, this form of art, has obtained such popularity. Sculpturing using marble is not a contemporary form of art technique. Much before the painting on the cave walls, early primitive men, fashioned shapes using stone. Right from those augmentations, artifacts have evolved to their current complexity. In general terms, this form of art, deals with the creation of three-dimensional forms from marble. Even though, sculptures can be produced using other popular stones, artist prefer marble upon everything else. One of the prime reasons is that only marble offers a fine translucent surface to work on. This material provides a desired visual depth to the sculpture that necessitates its beauty. Marble on the other hand, also has the advantage of providing smoother finish and finer touch. More so, unlike wood, this material being made out of limestone is weather resistant and can remain damage-free for a long time. Artists mention that marble is also the only form of the sculpturing wherein its each and every block has a figurine inside it. It is the skill and the dexterity of the maker to discern it. 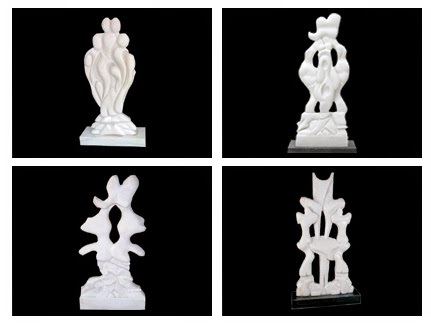 Marble sculpture artist, Neeraj Gupta hosts a collection of his own, hand-made marble figurines. He is well-known for the perfection and dedication that he pours in each master piece he creates. The shapes of his sculptures impeccably weave both variety and content into a unified vision, providing a touch of spiritualism and aesthetics in all his creations. His lines and forms of work, unlike other artists, contain fluidity that enthralls and charms the spectator. Beauty in white or Elegance defined- call them whatever you want but these masterpieces from marble sculpture artists in India never fail to catch the admiration of onlookers from time immemorial. Marble sculptures have a unique place inthe history of India, and if researched carefully it can be seen that Mughal period was the peak for marble as a material for art. Many important monuments used marble as a building material with intricate art work at various places including Taj Mahal. Seen commonly are frames of doors and windows with delicate inlay work in marble and sometimes floral patterns in different colours which look extremely pleasing to the eye. It is not only India, but other countries especially Italy has seen rampant use of marble as material for sculptures. There are number of famous artists from Italy- Michelangelo being one of them. He was known for his art with Marble and there are number of sculptures to his credit. He worked primarily with marble and like any other material; it had its own challenges to deal with. Artists had to first of all deal with the logistics of huge chunks of stone used for sculpture which had a cost attached to it. Then to create a huge sculpture, one had to have some help like assistants who could start draft work like cutting bigger stone into chunks as per design of the master sculptor. In the times of Michelangelo i.e. around early fifteen century, his assistants would transfer points from small sample model made by him to the huge block roughly which was then carved and detailed by the master himself. To make sure his assistants made the right blocks, master sculptor artists used to make small models of clay or wax which were referred to as Bozzetti. These three dimensional models was a great way for the artists to see how the bigger sculpture of marble will look like once finished as before this- it is in their imagination only that they saw those. Drawings were a way to depict their thoughts on how the model should look but three dimensional models went a step further and made the carving of marble sculptures relatively easier process. Many times these bozzetti were created by the sculpture artists but were never eventually transferred to real marble sculptures due to some reason or the other but they itself attracted fascination of people later. They were not pieces of marble sculptures, but at least depicted thought process and creativity of the sculpture artists. Thus we see that artists founded bozzetti as a process so that creating marble sculptures became a bit easy for them but it itself became an object of art and received appreciation till years later.